These are all the things that I have always striven for in my portrait sessions. When I started working with couples, it was my goal to achieve images where you can really get a sense of who the couple is... what their personalities are like... and most importantly, what they feel for one another. Those are the types of images I have always been drawn to and those are the types of images I like to capture for my clients. I'm not going to lie. It took a whole lot of practice to really find a way to get this but it's something that truly makes me proud of the work I do. Why? Because I don't think portrait sessions should be staged to become a replica of something off of Pinterest. I say this only because I don't think any one couple can just be replicated. 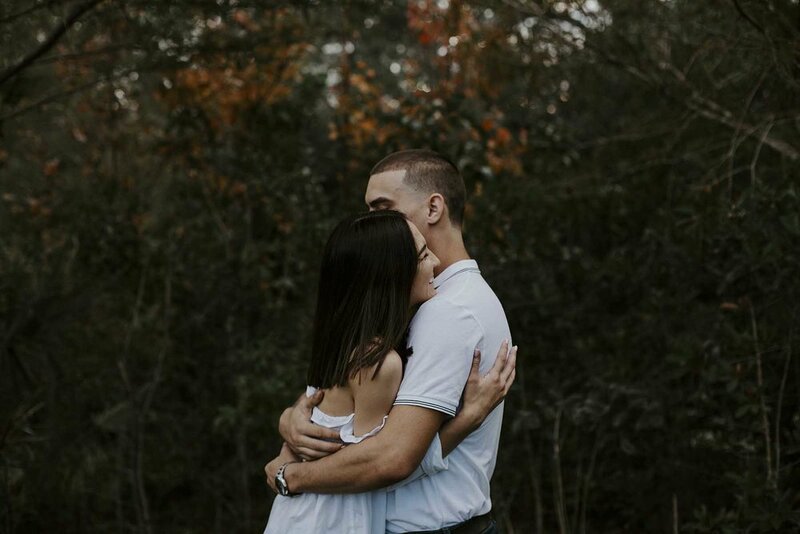 Emotions that are genuine are unique and as a photographer, I think my goal should always be to try to find ways in which to make my couples feel comfortable enough in front of the camera so that those emotions can really shine through. Let's be real here... most people feel awkward having their photo taken (myself included). It can be a little intimidating and you worry about looking goofy and it's easy to look at the camera and think "cheese". Yes, those types of portraits are sometimes needed and sometimes desired but I like my work to be more candid - I like to capture images that happen organically. Beatriz + Oscar truly embraced their session with me. As you can see in most of their images, they were filled with laughter and sweet moments with one another. Together, we did a whole lot of exploring and laughing and honestly, we just had a lot of fun. Beatriz left a review for me on The Knot and this is what she said: "Adriana's gift for capturing special moments is unbelievable! She made the whole photo shoot a lot of fun and special. " Fun and Special. YES!!!!!! That's exactly how I want all of my clients to feel! I want them to have FUN during their session so that I can capture it all! I strive to ensure that every. single. session is not just a session but instead, an opportunity to create amazing memories together!! That's what it's all about, my peeps! Let's go on an adventure together and have some fun, shall we?